Just 14.8 percent of the 6,173 early applicants to Harvard College’s Class of 2020 received acceptance emails on Thursday afternoon, marking the lowest early acceptance rate since Harvard reinstated its early action program in 2011. 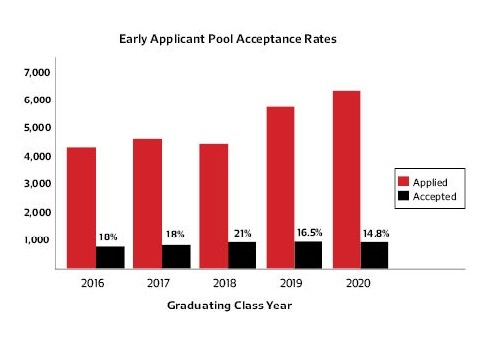 While the size of the early action pool increased slightly—about 4.3 percent larger than last year—the acceptance rate fell 1.7 percent, with 918 students receiving offers of admission. Although Dean of Admissions and Financial Aid William R. Fitzsimmons ’67 said that the admissions department does not set a numerical quota for early action acceptances, he added that admissions officers are careful to leave room in the class for applicants from the regular cycle. When deciding to admit a student during the early cycle, “we want to be not 99 percent certain, but 100 percent certain that we would also admit the person later,” Fitzsimmons said. Of those not admitted to the class, 4,673 students were deferred to the regular cycle, while 464 were denied admission, 12 withdrew, and 106 submitted incomplete applications. Fitzsimmons also cautioned against the notion that applying early would bolster a student’s odds of admission, instead attributing the higher acceptance rate for early applicants to the stronger applicant pool during the early cycle. Last year, the Class of 2019 saw a 2.8 percent regular acceptance rate after an early action cycle that accepted 16.5 percent of applicants. Of those admitted early to the Class of 2020, 24.2 percent identify as Asian American, a 1.5 percent increase from last year’s early cycle. The percentages of the pool comprised of African American and Latino students admitted each fell slightly, to 9.4 and 9.6 percent respectively from 10.3 and 11.4 percent last year. In addition, 1.8 percent of accepted students identify as Native American and Native Hawaiian. Of the accepted students, 47.4 percent identify as female, marking a slight decrease from last year’s near-parity in the early pool. Although Fitzsimmons was unable to provide a precise figure for the number of students who would apply for financial aid, he said that 11.4 percent of admitted students requested a fee waiver for their application and 10.1 percent were first-generation college students, up from 9.5 percent last year. Fitzsimmons declined to comment on the number of legacy students admitted to the class. The number of accepted students indicating interest in the humanities increased slightly to 16.7 percent from 14.8 percent last year, which Fitzsimmons credits to the division’s new Theater, Dance, and Media concentration, the reopening of the Harvard Art Museums, and what he called the College’s “special effort to double down on the humanities.” The School of Engineering and Applied Sciences also saw an increase in prospective concentrators, up to 11.1 percent from 9.4 percent last year. Meanwhile, the number of students indicating interest in the social sciences fell four percentage points to 24.4 percent this year. Fitzsimmons said that the decline was likely due to surging interest in the humanities and engineering, and added that he had heard “not even one mention” of concern for the quality of Harvard’s social science programs. The Crimson was granted early access to admissions figures and an interview with Fitzsimmons under the condition that it not publish the story until Friday morning. Anna Cowenhoven, a spokesperson for the Faculty of Arts and Sciences, sat in on the interview via conference call.